The truth is that children and swimming pools can be a deadly mix. Anyone with a swimming pool—or whose neighbors or parents/family have a swimming pool—should be uber vigilant about their kids near pools. Plain and simple. Every year, approximately 800 children die from drowning. Last year, at least 163 children fatally drowned in a swimming pool or spa…of those, nearly 70 percent were children younger than five. When polled, half of all parents think they are able to effectively supervise their children around the water by listening for calls for help. While drowning is often portrayed as a loud, dramatic, and eye-catching event in movies and such, in real-life, drowning is usually completely silent. Sadly, many of us know of someone (or a friend of a friend) who has lost a child this way. Many of us have had close calls ourselves. One friend found her toddler sitting on the edge of her parent’s pool in Florida on Thanksgiving when someone accidentally left the sliding glass door open to let the dog out. Nobody plans on these things happening, and yet they do. There are many childproofing things I roll my eyes at; this is not one of them. There are several steps caregivers and pool owners can take to help keep kids safe in and around the water. Parents with children who have a pool have a special responsibility to babyproof their pools and hot tubs—not only for their own kids, but for your children’s friends and neighbors. The takeaway is this: If you have a pool, childproof the entire area, including the exterior doors and windows leading to the pool; install a four-sided fence that’s at least 4-5 feet tall, with a self-closing, self-latching gate around all pools and spas; never prop the gate to the pool area open. Additionally, the use of a gate alarm can provide additional peace of mind and security. Though there is no federal pool fence law currently in place within the US, several states, including Florida, and Arizona, have created their own individual pool fence laws. Most municipalities now require this—even for pool owners who don’t have children. And if you own a home with a pool, your homeowner’s policy will require it as well. 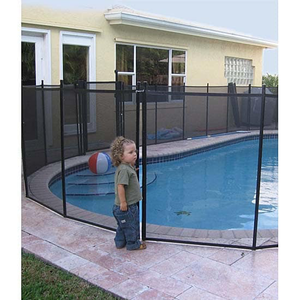 There are a couple of other products on the market to help keep kids safe in and around your pool (none of which take the place of the above-mentioned fence, by the way). The first is a Pool Net, like this one from Katchakid (see below). This UV and winter-safe net stretches over the entire pool and anchors to mounted fasteners on the pool’s sides. Its purpose is to protect children from jumping into and drowning in the open water. Katchakid pool nets are professionally installed by rigorously trained and certified technicians, and the company proclaims that “no child has ever drowned in a pool protected by a correctly installed Katchakid.” You can schedule a free consultation and request a custom quote from them here. A backup measure for keeping your kids safe near pools, especially while visiting a friend or while on vacation, is through wearable devices. These devices are intended to alarm you when our child has been submerged in the water. We used this while staying at a rental house in Napa that had a pool (I literally couldn’t sleep at night, I was so worried…). It comes with a “turtle” wristband for your child, a base alarm for the house (which can also be plugged in outside—but note that the base is not weatherproof) and a USB cord/wall adapter. Even when it’s plugged in inside, it’s loud enough that you’ll hear it at the pool (it’s loud!). Safety Turtle is very sensitive, and it alerts you as soon as your child’s wrist gets wet. It would go off during handwashing, which was fairly annoying – but whatevs. It’s also impossible for kids to take off themselves, as it requires a custom key to remove the band (this is something users both love and despise…). To recap, your kid cannot remove it himself. If you have more than one child (or your kiddo is having friends over to swim), one base alarm can support unlimited Turtle wristbands — and even collar attachments for pets (I could tell you a sad story about a pug….😱). It goes without saying that these devices are back-up safety measures. No device can ever take the place of a responsible and vigilant caregiver! Never take your eyes off your kids when you’re near a body of water (yes, even the little inflatable baby pool in the backyard! ), even if they know how to swim independently. Swim Safely suggests designating an adult “Water Watcher” to supervise children at all times around the water. We’ve had moments on vacation where there was confusion over who was “on duty” watching the kids in the water—be sure you are perfectly clear about whose turn it is! All parents and caregivers should learn CPR. While useful, “floaties” do not take the place of adult supervision; in fact, they can provide a false sense of security for kiddos and parents, and do not prevent drowning accidents. When you’re done swimming for the day, don’t leave toys in the pool; kids may jump in the pool when you’re not looking to play with them. Make sure everyone in the family knows how to swim; according to the American Academy of Pediatrics (AAP), “participation in formal swim lessons can reduce the likelihood of childhood drowning death by 88%”. Don’t swim in a pool with broken or missing drain covers—these can trap swimmers underwater; teach children to stay away from pool drains, pipes, and other openings to avoid entrapments. If you have a pool and don’t know where your child is … check the pool FIRST. I hope this wasn’t too scary! Between this and car seats, I swear… #joykill!! I promise if you take the necessary precautions to keep your kids safe around water, you will sleep better at night.